I have plants and live in Austin, a place where summertime temps top 100 degrees. I travel a lot. While I’m gone, my plants inevitably get thirsty and die. This saddens me, mostly because I grow herbs and nothing pisses me off more than buying a bundle of mint for $3 knowing I could have just picked it from my yard. This is why I’ve spent a lot of time researching gardening sensor networks that combine things like soil moisture sensors with Wi-Fi networks to let you know when your plant needs water. The frustrating thing is none of those let you do anything, so you might get an email or text from the system saying, “I’m thirsty” while you’re stuck in a conference in Vegas. At that point, you can either accept that the plant’s continued pleas for water will go unheeded or ignore the slow death occurring in your backyard. But if I could get those texts and then do something about it, I’d no longer be a plant killer. That’s one reason why I got excited about PlantLink, a product from Oso Technologies, a Champaign, Ill.-based startup that’s seeking $75,000 on Kickstarter. The project offers a ZigBee-based system for monitoring plants and transmitting that data to the cloud via a gateway, but it also has a valve that you can attach to your hose and then use to turn on the water. The other subtle difference in this project is that the cloud aspect of the service actually tracks what type of plant the sensor is near and tracks the soil moisture levels based on the specific needs of that type of plant. Some other products do this, but the trifecta of sensor, service and valve clinches it. Oso Technologies has raised an undisclosed amount of seed capital from Serra Ventures and Illinois Ventures to get the five founders started with development. The company is now also working with SmartThings, the company that is building a home automation center that can also interact with the online world. The deal means the PlantLink system can be controlled from the SmartThings hub. For now, the plan is to raise the $75,000 to produce the first batch of devices, and then to figure out how customers use them and what others might want. Austin Lyons, a co-founder of Oso, said that many professional farmers as well as botanists have contacted the team looking for something like this product that might work for their needs. Eventually, the hope is to get the systems on the shelves of a retailer like Home Depot, but the team still has a long way to go. I love this idea. 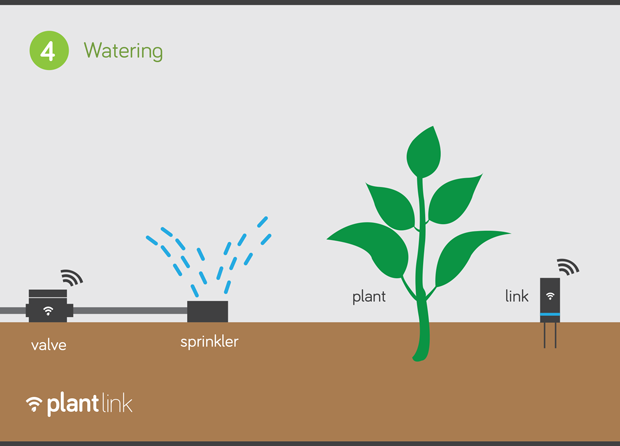 We have our plants watered by our automatic sprinkler system. Sometimes if we’re gone for a few days in the summer, temps in So Cal may spike and the system may not have been programmed for this. It would be great to know if the plants are in need of more water and be able to connect via iOS device to make adjustments.